Anderson Silva isn’t going anywhere any time soon and that’s why he’s still holding out hope for a showdown against Conor McGregor as well as a rematch against Nick Diaz. Anderson Silva still has plenty of fight left in him and that’s why he has no problem pursuing fights in the future with both Conor McGregor and Nick Diaz. As Silva prepares for his upcoming showdown at UFC 234 against Israel Adesanya, the 43-year old Brazilian legend isn’t slowing down when it comes to what he still hopes to accomplish in the sport. A win over Adesanya will earn Silva another shot at the middleweight title according to UFC president Dana White and that’s not the only big fight he hopes to pursue before calling it a career one day. Sila has long talked about facing off with UFC cash cow Conor McGregor and he revealed recently that he has talked to White about trying to make that fight happen. “Conor is a great name,” Silva said during his media day in Los Angeles earlier this week. “I think first of all Conor challenged me and I talked to Dana about that and Dana said ‘come on Anderson’ and I said ‘come on Dana’. Dana said ‘no, no no’ and I said ‘yeah, yeah, yeah’. McGregor has mentioned facing Silva as well in the past, although the size discrepancy between the two fighters would still appear to be the biggest problem putting that fight together. McGregor typically competes as a lightweight and Silva fights at 185 pounds, putting a whopping 30 pound weight disparity between them. Still, Silva believes it’s a matchup that could happen under the right circumstances. Another fight that also interests Silva is a rematch against Nick Diaz after they first met in 2015. On that night, Silva won the fight by unanimous decision but the victory was later overturned to a no contest when the former middleweight champion tested positive for a banned substance. Silva was suspended for one year and his win over Diaz was vacated as part of his punishment. That’s why Silva would gladly face Diaz again in the future to settle a little bit of unfinished business from their first encounter. First things first, Silva has to face off with Adesanya on Feb. 9 in Australia with the winner then expected to take on the victor from the main event where middleweight champion Robert Whittaker meets Kelvin Gastelum from Australia. 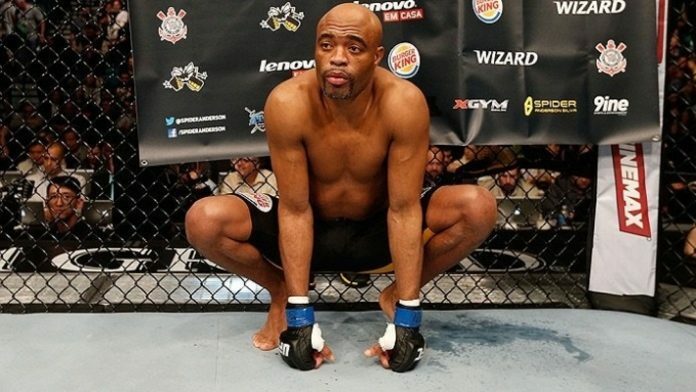 Would you like to see Anderson Silva against Conor McGregor or Nick Diaz in the future? Sound off in the comments and let us know!